I was lurking in Waterstone’s Tunbridge Wells one day in the mid 1990s. (It had an apostrophe in the name then so I’ve left it in for authenticity.) My favourite genres were historical fiction, sci-fi, thrillers and crime. Wandering round the tables and shelves, nothing struck me, nothing shouted ‘Me! Me! Me!’ I was in Crime, profoundly unhappy that I was actually going to leave the shop empty-handed. I was ready to commit a crime myself. Turning to leave, I glanced down at the bottom shelf and saw a series of colourful titles by the same author. Ooh! A series. I picked one up. Oh gods, they were set in Roman times. Even better, in Vespasian’s reign – my favourite emperor. I scanned the back cover of Book 1 (The Silver Pigs) and laughed out loud. Sosia’s uncle is a senator with suspicions. 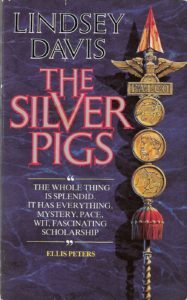 Some friends, Romans and countrymen are doing a highly profitable, if highly illegal trade in silver ingots, or pigs. For Falco, it’s the start of a murderous trail that leads far beyond the seven hills. To a godforsaken land called Britain, to Emperor Vespasian himself and to Helena Justina – a lady leagues out of Falco’s class. I almost tripped over my feet getting to the cash desk with my £5.99. I returned two days later and bought the next one (Shadows in Bronze). Thus began my love affair with Falco. (Not him personally; Helena Justina would have had my eyes out and gently toasted them for supper while reciting an ode in elegant tones.) After I’d read all those already out I had to wait patiently for the next one. What was so gripping about these twenty books? 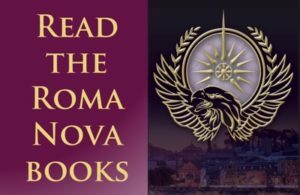 The accurate historical detail vividly brought to life, the complex plots completely woven into Roman life in the first century, the banter between the characters? Yes, of course, but it was the character of Falco with his outstanding individualism almost unrestrained by the social framework of his time. Beleaguered by his scoundrel father, hen-pecked by his mother and sisters, and ‘persuaded’ by the clever, generous and loving Helena Justina, he weaves his way, not always successfully through every aspect of Roman life. 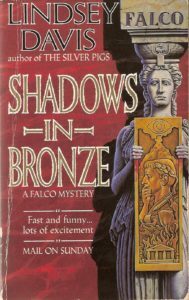 Falco solves mysteries, trivial, brutal and imperial, collects taxes, reads his (dreadful) poetry, slaves in a mine, dines with emperors and travels across the whole Roman Empire. Over twenty books, he struggles with security, his urge to survive control by his womenfolk (daughters included), and his nemesis, Anacrites. He is a (generally) faithful friend to his old army comrade, Petro, and together they take the final step which every reader realises they must. Lindsey Davis took a break from Falco to return to her first deep love, the English Civil War, in Rebels and Traitors, a massive 742-page volume with all the intriguing social, domestic and political detail of her favourite historical period. While it was undoubtedly a historical tour de force, and did feature the story of star-crossed lovers Gideon and Juliana, it was not quite what Falco readers, including me, expected. It was a ‘book of the heart’, I feel. Master and God saw a return to Rome, but in the dangerous times of Domitian, Vespasian’s paranoid second son. 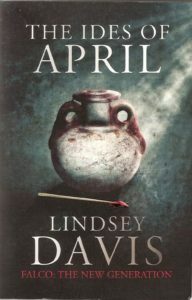 Again, Davis presents the lives of everyday, if slightly special, people; Gaius Vinius Clodianus, a physically and psychologically scarred centurion, nevertheless an honourable but emotionally closed man, and Flavia Lucilla, imperial hairdresser with access to the privileged but dangerous inner circle of the emperor. 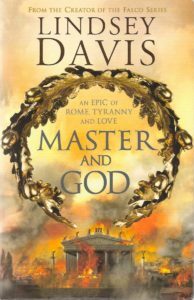 Cleverly, Davis tells us about the oppressive reign of Domitian while drawing for us a heartachingly tender story of Gaius and Lucilla. One to read and re-read! I’ve had the enormous pleasure of meeting Lindsey Davis four times and speaking at the same event once. 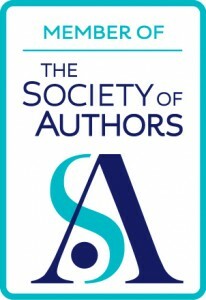 At the Historical Novel Society (HNS) conference in 2012, I was so overcome by seeing her that I was seized by stage fright and couldn’t get a word out. (I’d been fine with Diana Gabaldon, joking and chatting.) By 2014, I managed some half-sensible conversation and even shared a social cup of tea with her. She’s friendly and polite, but crumbs, what a sharp intelligence! 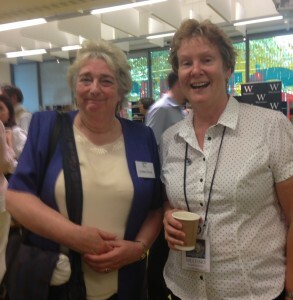 In Denver, at the 2015 HNS conference, I felt at ease with her and at the Wrexham Carnival of Words 2016 after the history evening, we ate chips and drank red wine together as all the speakers got together afterwards. So I raise a glass to Falco, Helena, Flavia Albia, Gaius, Lucilla, Gideon and Juliana and to their creator, Lindsey Davis. Sanitas bona! Thank you for introducing me to Lindsey Davis’ books. 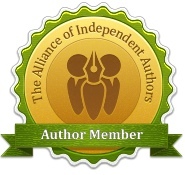 I found her on Amazon and plan to read her work. Falco has an excellent sense of humour,self-deprecating but honest in many ways. I too had the enormous pleasure of meeting Lindsey a few weeks ago in Naples. It was her Pompeii tour and we all stayed at the same hotel. She is absolutely delightful,funny and charming and we spent some time talking with her late in the evening sharing a bottle of wine. She has no pretensions and is so easy to talk to, definitely one of the best holidays ever and she is responsible fo my love of Roman history! 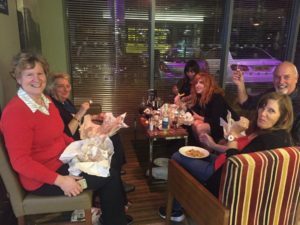 This brought back happy memories so thank you Alison and l enjoy reading your monthly blog! How lovely to be in Pompeii with Lindsey! We had a rather earnest, learned professor with a thick accent; a great character for one of my books but not a ‘light listen’. I’m glad this triggered such lovely memories for you.